Holiness was important to Calvin and he often insisted on it. I am a United Methodist pastor steeped in the tradition of John Wesley. Therefore, I am not supposed to like John Calvin. But I do. Here’s why. Physically frail, bookish and painfully shy, Calvin nevertheless exercised strong pastoral leadership under very volatile circumstances. In other words, the guy had courage and I admire him for it. Geneva, which became the center of his work, was politically unstable and financially strapped. Having recently become Reformed, this city of 10,000 inhabitants lacked appropriately trained pastors. Calvin was called to Geneva in 1536 to supply the leadership, only to be booted from town in 1538, the victim of being on the wrong side of political infighting. And then, when called by some of the same people who had worked to have him ousted, he returned to Geneva in 1541 and stayed till his death in 1564. 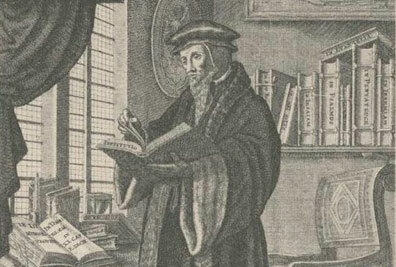 John Calvin in his study. In spite of political fractiousness and resistance, then, Calvin served steadfastly. He wrote prodigiously. His Ecclesiastical Ordinances provided the Genevan church with the organization and order it needed. His Institutes of the Christian Religion, originally meant as a manual of instruction for Christian initiation, expanded over several editions into the magnum opus of Reformed thought. He penned numerous commentaries on biblical books. He wrote treatises and letters. He preached constantly. And as Protestant exiles streamed into Geneva, he taught and his ideas began to spread. Therefore, as Alister McGrath has written in A Life of John Calvin, “To speak of Calvin is to speak of Geneva.” Given the exceedingly challenging circumstances of sixteenth-century Europe, this is a truly amazing thing to say about someone. While many people familiar with Calvin’s life know all of what I just summarized, some are quick to say, “That may be true, but what about Michael Servetus?” Genevan authorities put Servetus to death for heresy, since he held and promoted anti-trinitarian and anti-infant baptism views. And he wouldn’t leave town. Calvin is often blamed for his death, which proves to critics that he was cruel and dictatorial. Which means that the critics then feel justified in dismissing his ideas. While we need to understand the historical events that led to Servetus’ death, as one who lives in a part of the Protestant church sometimes proudly “not Reformed,” it pains me that we dismiss Calvin because of this one incident and miss the privilege of interacting with this great Reformer’s contributions. Which brings me to the quote at the top of this post. It comes from Book III, chapter 6, of the Institutes of the Christian Religion and it is by no means an isolated comment. In fact, as one reads widely in that part of the Institutes, one sees how important a theme it must have been for Mr. Calvin. It is clear, in reading John Calvin’s works, that he really cared about holiness. He cared deeply about godly character, not just for individual Christians but also for the whole community. We Methodists tend to think holiness is our turf. Some of us would be surprised. As we approach the five hundredth anniversary of the beginning of the Protestant Reformation, I have a little dream. Let’s recommit to getting to know these Reformers in their own terms and contexts. (Thank you, Christian History for helping us!) Sometimes, proponents of diverse parts of the Protestant tradition know only caricatures of other parts. Maybe we could change. More from Stephen Rankin in Amid the Wreck of Things from CHM #104 on the Industrial Economy and Confessor in Chief from CHM #111 on Billy Graham. Don't miss Christian History magazine #120 on "Calvin, Councils, and Confessions," available for preorder here.